On Saturday 13th April 2019 the members of Francis Street Bowlers made three generous donation to three local groups. A day spent playing bowls at the opening day of the season at Thurso Bowling Club was followed by a buffet tea after which they presented the cheques. League of Friends of Caithness General Hospital £200. Bill Fernie, chairman of Laurandy Day Centre thanked the members of the Francis Street Bowlers for their donations. He said, "We are fortunate to have such generosity towards charitable works in our community. The work of all of the groups play an important part in making things work well in our area. The constant need to raise funds is made much easier by such donations like these." The Laurandy Centre has been recognised as one of the leading home care services in Scotland. The Wick-based day care service, has won the Day Service of the Year the recent Scottish Care Awards 2018. Laurandy Day Care Centre held a fund-raiser day at Tesco , Wick and raised £526.29 at Tesco on Saturday 20th January 2018. Chairman of Laurandy Day Care Centre, Bill Fernie said,"We thank the public once again for their generosity. 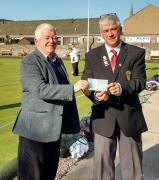 St Fergus Bowling club in Wick recently donated £300 to the Laurandy Day Care Centre in Wick. St Fergus Bowling Club Chairman Malky Mackay handed over a cheque for £300 to Laurandy Centre chairman Bill Fernie. A variety of groups that involve young mothers is likely to arrive with pushchairs and prams on Monday. Several groups from around Caithness intend to be represented at the Noon Demonstration with several intending to attend both the noon and 6:00pm demos. As local feeling continues to rise on the Maternity Services issue in Caithness confirmation has been given that a second demonstration will take place at 6:00pm at Caithness General Hospital on Monday 15th. The first demo will happen to coincide with the arrival of Professor Calder and his team as part of the review. From 1st May 2017 Alzheimers Scotland will no longer offer their services in Caithness for people suffering from dementia. Couthie Corner, Thurso based at Bayview will no longer be run by Alzheimer Scotland but will instead be run by the NHS and the Longberry day service in Wick will be taken over by Laurandy.